Eclectic Paperie: Looking for Glue Pads? Lookie, lookie what's new at Ecelctic Paperie. " 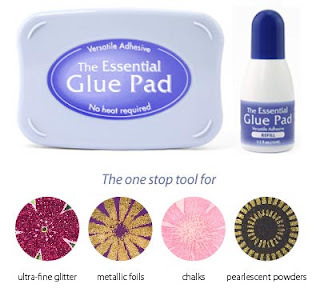 The Essential Glue Pad is a clear, heat free adhesive for all your creative needs — without the use of a heat gun! Just stamp, daub or apply a light layer of glue to your project and apply your embellishments. It’s that easy!" The much anticipated arrival of the Essential Glue Pad by Tsukineko is here. We only have 18 left as I write this. Designed for today’s crafters and scrapbookers, the Brilliance Dew Drop™ inkpads feature enticing shades ranging from primary brights to pearlescent jewel tones and rich metallics. Compactly sized, with both a round end and an elongated tip, the versatile petite inkpads are colorful, collectible and free standing. Popular colors and opaque ink coverage create the ideal ink for stamping, stenciling and direct-to-surface techniques. Ideal for today’s busy crafters and scrapbookers, the VersaMagic® Dew Drop™ inkpads come in an array of colors ranging from soft pastels to natural earth tones and rich jewel tones. Compactly sized, with both a round end and an elongated tip, the Dew Drops are colorful, collectible and free standing. NOTE: If you are looking for a color comparison for Stampin' Up! inks vs. these VersaMagic Dew Drops, check out the chart that Beate posted on her blog. We are working on a brand new newsletter. It's in progress and we hope to have it out by the end of the week. If you placed an order with Eclectic Paperie since we opened this past January, then we have your name on the email list. The newsletter will be fabulous 'cause we found a special someone to help us out with this. Finally, be on the lookout for a great Mother's Day offering that we are working on. It is "oh-so-cool!" that we can't wait to share it with you. It will be a one of kind, special edition Mother's Day package exclusive to Eclectic Paperie. We will only have a limited number available, too.